It may be a free-to-play mobile port of a browser-based game, but Kingdom Hearts Unchained χ crams a lot of what series fans love into a tiny space. 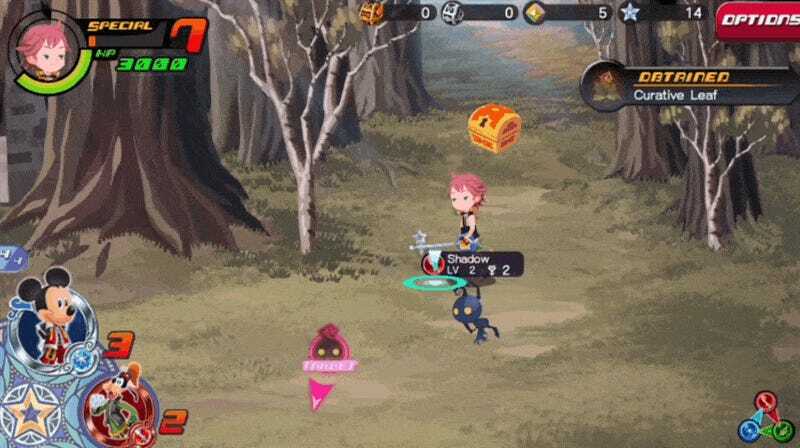 Prounounced Kingdom Hearts Unchained Chi (Key), the newly-released in North America Android and iOS originated as a Japanese browser game in 2013. Richard Eisenbeis called it “More Than I Expected From A Browser Game,” and it’s certainly more than I was expecting from a mobile title. Watch my initial video impressions below. For one, it’s no side story. The game acts as a prequel to the Kingdom Hearts series, telling the story of a battle between five factions over the remaining light in the world prior to the Keyblade War, the event that started this crazy Final Fantasy/Disney crossover in the first place. It’s got a story that links to the upcoming Kingdom Hearts III. Disney characters abound. The music is lovely, as we’ve come to expect from series composure Yoko Shimumura. The storybook art style is a delight to look at. Fans looking for a little more depth are in for a treat as well. Players can collect and upgrade Avatar Boards to increase their stats and unlock new cosmetic items. Collectible character medals provide special attacks in battle. The battles are simple-yet-satisfying tap to attack and explore affairs, easily completed in a short amount of time. There’s an elemental relationship aspect to enemies and the medals that cycle along the bottom left of the screen as you fight, so switching up your loadout from time-to-time might be a good idea. It is a free-to-play game, and there are things to purchase. Kingdom Hearts Unchained χ isn’t obnoxious about trying to sell players on premium content though. It used up all of its obnoxious putting that fancy character in its title, making people have to cut and paste it every time they write about it. While it’s a departure from anything we’ve seen in the series before, Kingdom Hearts Unchained χ gathers together the things I appreciate about the series and presents them in a compelling way. As things to do while we wait for Kingdom Hearts III go, you could do a lot worse.